The Postings Shopping Centre goes up for auction with a £1 pricetag next week – and you can watch the bidding online. The controversial sale will be streamed live from London on Tuesday. Owners of the struggling centre, Columbia Threadneedle, generated UK-wide headlines when it slapped a £1 price tag on the property in a bid to get it off its books three years after the loss of Tesco saw a devastating collapse in footfall. The centre, opened at a cost of £4.2m in 1981 and hailed as “mecca” for shoppers, has only four units occupied, and the owners say they have had a lot of interest in the fire sale price. Lesley Laird, MP for Kirkcaldy and Cowdenbeath, spoke with them last week, and confirmed there were several buyers in the wings already. 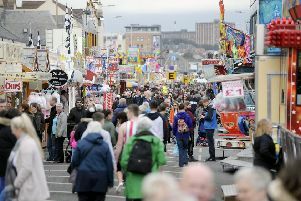 She said: “The £1 tagline generated substantial media interest across the UK but, first and foremost, this story belongs to Kirkcaldy and what happens next to our town centre. She stressed any new owner must have a clear plan of action for the centre – or the site it occupies in the heart of our town centre. BBC’s The One Show was in town on Thursday filming as piece about the sale, and brought former Generation Game hostess, Isla St Clair, back to see the place where she officially opened the Wm Low store in 1981. The item, is due to air on Monday’s programme. The auction on Tuesday has 75 lots with the Postings listed at number 72. It can be watched online HERE http://www.auction.co.uk/commercial/venue.asp to follow the coverage.